Joey’s brother Corey is active duty military and has served overseas multiple times in the 7 years I’ve been married into the family. The military has a special place in our hearts, and this week is Military Appreciation Week. In honor of that, let’s celebrate our military. Cheryl’s Cookies is offering 6 sample cookies plus free shipping to APO/FPO addresses. 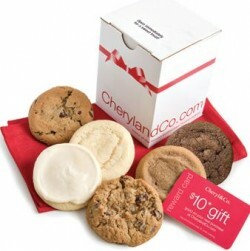 You can send this Cookie Sampler to an APO/FPO address for free! I know my brother-in-law would have been all over this when he was deployed!